Big Pharma has ruthlessly exploited a well-intentioned measure that sought to provide medications to treat patients with rare diseases that might otherwise have been ignored. Drug companies, instead, have manipulated the 1983 Orphan Drug Act to create legally protected monopolies so they can gouge desperate patients with astronomically priced products that already were taken by as many as millions. These findings, part of an investigation by Kaiser Health News, a nonpartisan service focused on health policy issues, were just some of the outrages that surfaced in recent days involving Big Pharma: Two big drug makers have just agreed to pay hundreds of millions in fines for anti-competitive practices or failing to report suspicious transactions, while two pharmacy operations also will fork over millions to settle suits with federal authorities over anti-kickback violations or lax controls. Kaiser said its scrutiny of orphan drugs, those targeted at diseases affecting fewer than 200,000 Americans nationwide, found that a third of the approvals by the federal Food and Drug Administration involved medications that already were approved for mass markets and were simply re-purposed. The agency also is approving multiple meds as orphans, sometimes as many as 80 different drugs for one rare disease. 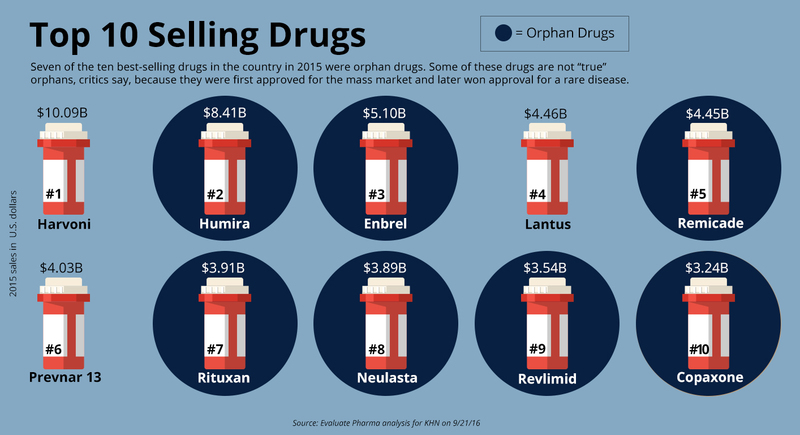 Makers are turning with greater frequency to this FDA classification, with just under half of all the new drugs approved being deemed as orphans. 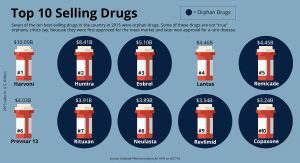 Seven of the 10 top selling medications have been designated as orphans. The classification is important because it gives manufacturers seven years of exclusivity for their products in serving small groups of patients whose demand is typically huge. This means the companies can jack up their products’ prices. Makers also can return repeatedly to the FDA, asserting that their study shows a given drug also could be used to treat another rare disease and, thus, should be deemed an orphan. Uncle Sam recently has cracked down on at least one maker of a rare disease drug, a medication to treat infantile spasms. It once sold for $40 a vial but the Federal Trade Commission, in a lawsuit, asserted that a series of companies, each acquiring the other, led to Mallinckrodt controlling the drug, Achtar Gel. The company sent the drug’s price skyward, ultimately reaching $34,000 a vial and leading to more than $1 billion in revenue. The FTC asserted that Mallinckrodt engaged in anti-competitive practices, including acquiring for $135 million a synthetic drug similar to Achtar, to maintain its monopoly. The company had said it has “limited direct competition” with the pricey product. The company agreed to pay $100 million to settle the FTC suit without admission of liability or wrongdoing. Meantime, McKesson, one of the nation’s largest pharmaceutical drug distributors, agreed to pay $150 million in fines to resolve federal prosecutors’ claims that it failed to report suspicious orders of powerful addictive, painkillers. The company also on a staggered basis must suspend sales of controlled substances from its distribution centers in Colorado, Ohio, Michigan and Florida for several years, Thomson Reuters news service has reported. Federal officials and the company in 2008 settled a similar case, with a $13.25 million settlement over prosecutors’ claims that McKesson failed to design and use a system to track effectively big shipments of the potent painkillers oxycodone and hydrocodone. The latest settlement was reached because the firm hadn’t put in place nor properly used the tracking systems agreed to previously, officials said. They noted that McKesson, in Colorado alone, processed more than 1.6 million controlled substance orders but told authorities of only 16 instances that it said were suspicious. As for the pharmacies and their penalties, Walgreens agreed to pay $50 million to settle a lawsuit with federal authorities over violations of anti-kickback rules in a case involving incentives given to seniors to fill their Medicare and Medicaid prescriptions. Costco has agreed to pay $12 million to settle a federal lawsuit, asserting its pharmacies in Washington, Michigan, and California, between 2012 and 2015, improperly filled prescriptions, kept poor records or failed to adequately track inventory. The suit, officials said, is part of federal efforts to crack down on prescription drug abuse nationwide. Costco says it has put in a $127 million pharmacy management system and tightened its audit practices to address issues raised in the federal suit. In my practice, I see plenty of the significant harms that dangerous drugs can do, and I see the huge toll that skyrocketing costs for medications and medical services can inflict on families. Lawmakers, policy-makers, and regulators need to step up their oversight on Big Pharma so it can’t exploit the best intentions of those seeking to help not only patients with rare diseases but also to protect the public from lax, risky, or unfair market practices.